NEW PRICE! Located on the southern edge of the Edwards Plateau just before the hills give way to the South Texas Plains, Pinon Ranchs 10,318+/- acres are a fusion of the Hill Country and South Texas. Dramatic topography, unspoiled vistas, and diverse plant species - including a rare proliferation of extraordinary pinon pine trees - make this recreational paradise unique in its class of elite Texas ranches. Owned and operated for decades by the the same family, Pinon epitomizes the larger-than-life Texas ranch culture. The ranch features towering cliffs, hidden caves, countless miles of jeep trails, Native American artifacts, and clear night skies that stretch beyond the imagination. The year-round big game hunting opportunities will occupy your dreams by night, then challenge your wit and stamina by day. This describes the experience that awaits you at Pinon. Location: The ranch is+20 miles north of Brackettville, with over 4 miles of frontage on the east side of FM 674. The ranch is approximately 120 miles west of San Antonio and 50 miles from Del Rio. Habitat: The ranch features 4.5 miles of the W. Nueces River and associated riparian habitat running north-south through the property. The river in this area is dry most of the time, but it can flow and hold water in pools after rain events. The hills and valleys on opposite sides of this river bottom provide fantastic views across the ranch. Topographical relief ranges from approximately 1,540 to over 2,020, nearly 500 feet! There are numerous great locations to glass wildlife from the hilltops and plan a stalk. The most notable trees on the ranch - and also the property&apos;s namesake - are the abundant pinon pines that can be found by the thousands, with many specimens in the "trophy" category. This ranch has some of largest pinon trees we have seen anywhere in our travels across Texas. Other trees and woody vegetation in this transitional area is typical of the Hill Country including live oak, shin oak, mesquite, walnut, pecan, redbud, mountain laurel, persimmon, algerito and juniper; along with a mix of South Texas brush including guajillo, blackbrush, guayacan, kidneywood, brazil, and other typical species providing high quality browse. The Pinons rangelands also contain a plethora of native grasses including sideoats grama (the state grass of Texas), purple threeawn, hooded windmill, sand dropseed, buffalograss, Texas grama, hairy grama, Canada wildrye, switchgrass and cane bluestem. Wildlife:Abundant native game including white-tailed deer, turkey, quail and dove provide excellent hunting opportunities. 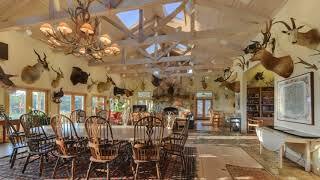 The ranch also boasts an extensive exotic game population, which allows for year-round hunting. The large resident axis deer herd is legendary for its trophy quality and is the exclamation point on the ranchs hunting opportunities. In 2010, a Pinon bowhunter took an Axis that reportedly would have made the top 3 at the time had the trophy been submitted. The majority of the ranch offers great low-fenced hunting of free-ranging native and exotic game. The owners were among the early pioneers of exotic game introduction, and many species can be found free-ranging across this region. Additionally, there are two high fenced pastures including an approximately 1,300-acre intensively managed enclosure with a supplemental feeding program. The other high fenced pasture (the Newman pasture) is about 1000 acres and provides the opportunity to implement a different management strategy if desired. Newman is currently managed predominantly for native game and axis deer. Exotic species commonly seen on the ranch include scimitar-horned oryx, axis deer, blackbuck antelope, fallow deer, red deer, aoudad and feral hogs. The ranch manages its white-tailed deer population under TPWDs Managed Lands Deer Program(Harvest Option). Elsewhere on the ranch are the 4BR and 3.5BA foremans residence and headquarters compound between the front gate and the main lodge compound. In the SE quadrant there is a small hunting cabin that sleeps 4, affectionately referred to as Camp II. And in the high fenced Newman Pasture, there is a 1,500 SF residence (used by one of the full-time staff) and associated historical outbuildings. A well-maintained 4,500-foot paved private airport runway is located on the ranch - just a short drive north of the main lodge compound. Minerals:Sellers fee minerals, if any, are negotiable. There appear to be a small quantity of state classified minerals on the northern border of ranch. All rights associated with any state classified minerals associated with the ranch will convey. Price: Now asking $13,619,760 or $1,320/acre. The ranch is+20 miles north of Brackettville, with over 4 miles of frontage on the east side of FM 674. The ranch is approximately 120 miles west of San Antonio and 50 miles from Del Rio.